If we lived in a perfect world, there'd be a Shake Shack on every corner and Mr. Bean would be legally required to appear in every movie from this point forward. But we live in a fallen world, so we have to take Mr. Bean as he comes. He's just a man after all. With regard to the Shake Shack question, on the other hand, we're getting a little closer. For the first time, Shake Shack is unleashing food trucks, further unshackling itself from its status as a coastal-elite, New York-only burger chain. These food trucks will hit the road in early February in New Jersey and Atlanta, according to an announcement by Shake Shack CEO Randy Garutti at ICR, later reported on by Skift Table. The trucks will reportedly be staffed and supported by local brick-and-mortar Shake Shacks and appear at community events, festivals, private parties, etc. Honestly, such a damn good question. Garutti pointed out that this is an extension of the company's broader push into stadiums, airports, and food courts, the last of which the company never planned to appear in. 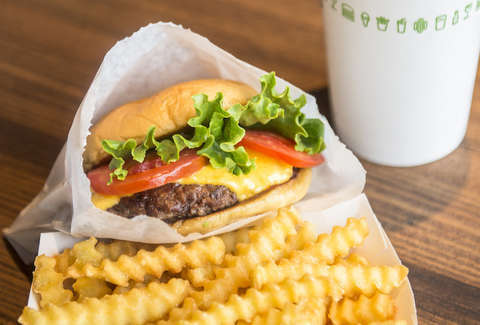 When reached on Thursday, a Shake Shack spokesperson said the chain will release additional information on timing, menus, and booking for the trucks in "in the next few weeks." Last year, Shake Shack opened 34 locations in the US and spread to 16 countries. That means that 80% of Shake Shack is now outside New York, a fact we're sure Malcolm Gladwell can't wait to wow someone with at a party. This year, it has plans to open 36 to 40 more, but 80% of those will reportedly be in existing markets -- so we're still far away from a Shack Shake on every corner in America. But we're a lot closer to that than getting Mr. Bean into every movie.